ONCE UPON A TIME ON A FINE SPRING DAY… the lady of the house went to the store and bought a small pothos. 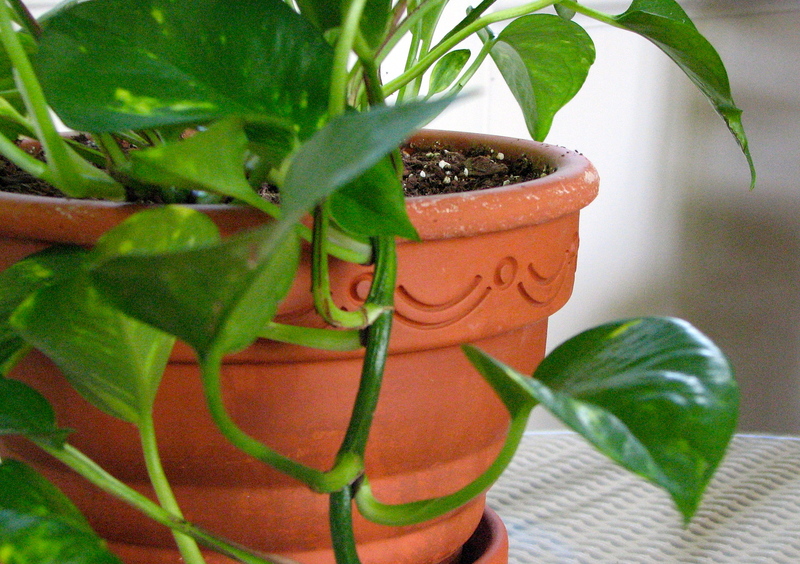 She brought it home and planted the pothos in a beautiful terra-cotta pot that featured smiles & dots on its rim. 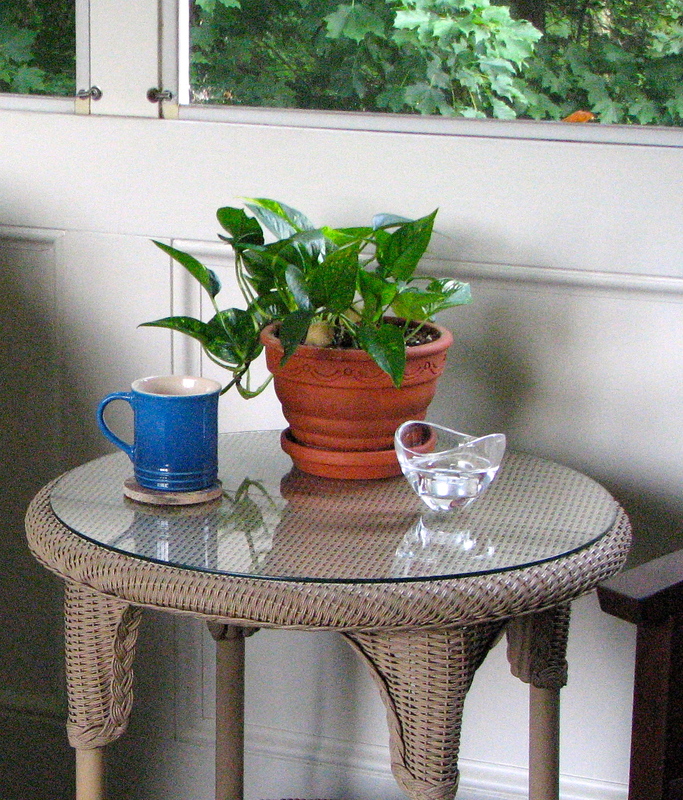 The lady of the house was very happy with how her new pothos looked in her favorite pot, so she put the potted pothos in the screened-in porch of her home. There, the lady of the house was certain, the potted pothos would thrive. 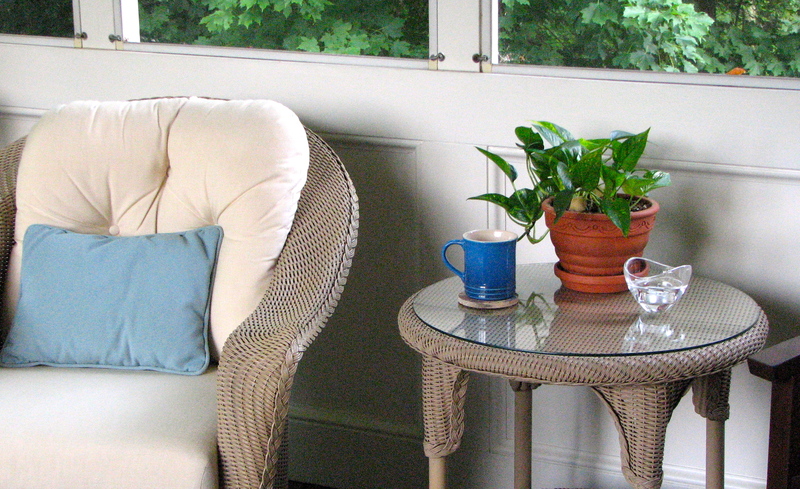 WHEN SUMMER CAME UPON THE LAND… the lady of the house decided to take her early morning mug of coffee onto the screened-in porch, sit in her favorite wicker chair, sip her java and gaze upon her potted pothos in the pretty pot on the porch. And all was well in the land. UNTIL ONE MORNING… the lady of the house realized that there was something new & different about her pothos. That during the previous hot, humid night the potted pothos had changed in a very weird way. But the lady of the house ignored the man of the house’s advice and decided to look very carefully at the mushrooms that had formed on her favorite potted pothos. As she did this she realized that the mushrooms were a pretty shade of yellow that just happened to match the tiny yellow stripe on the pillows in the screened-in porch. Such attention to detail delighted the lady of the house. Yes, the mushrooms were an interesting development to be sure. And suddenly the lady of the house had an idea. 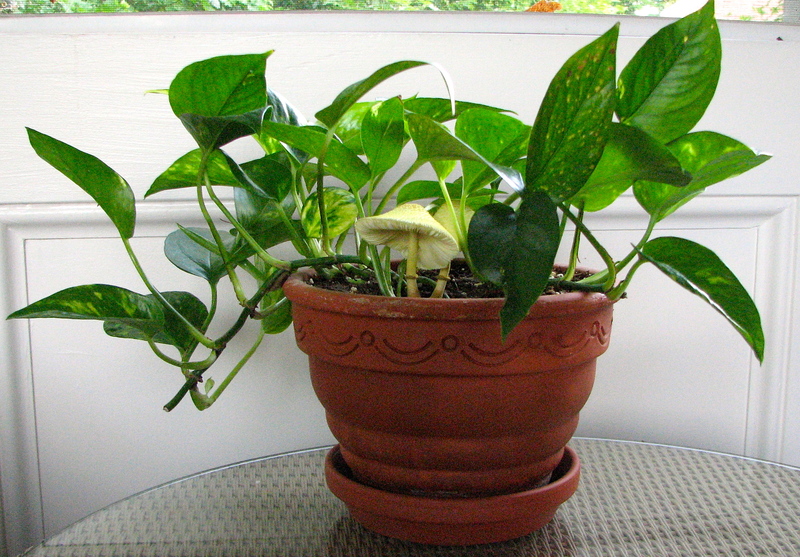 FEELING THAT THERE MUST BE AN EXPLANATION FOR THIS TURN OF EVENTS… the lady of the house found a link to a webpage that explained exactly what was going on with her potted pothos in the pretty pot on the porch. 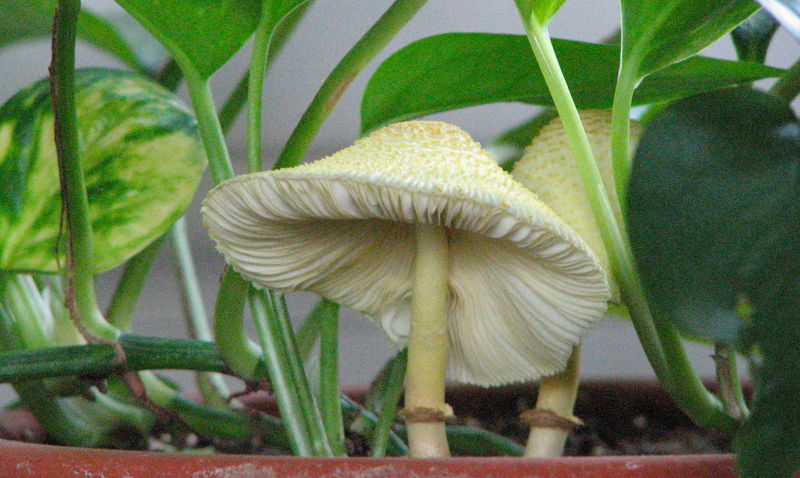 She discovered that her beloved potted pothos had a fungus called Leucocoprinus birnbaumii, aka Lepiota lutea, the yellow houseplant mushroom. Further she learned that this fungus, which had created these yellow mushrooms, was harmless as long as it was not ingested. And there was learning in the land. AS YOU MIGHT IMAGINE… the lady of the house had absolutely no intention of eating these mushrooms. Or of letting her precious morning mug of coffee come in contact with them. The lady of the house had common sense– and then some. So she let the yellow mushrooms be & allowed them to go through their 48 hour [more or less] life cycle. During which time she enjoyed the unexpected, color-coordinated bit of beauty that they added to her potted pothos in the pretty pot on the porch. And once again there was peace in the land. I am suprised the Lady has not given our Lepiota lutea proper names – like Luke and Laura. Good idea. But we need “P” names to make it work perfectly. I don’t know any famous couple who has names that start with “P”, do you? After a fast little search on The Google the only famous couple I found with “P” names is: Pierrot and Pierrette. I was only sort of aware of them. They are stock characters in French pantomime. Pierrot is the foolish male who is too trusting & moonstruck over Pierrette. She is the lovable female who is tender, but saucy & smart. Together they were popular in carnival shows. Need more info about them? Click here. Ooo! 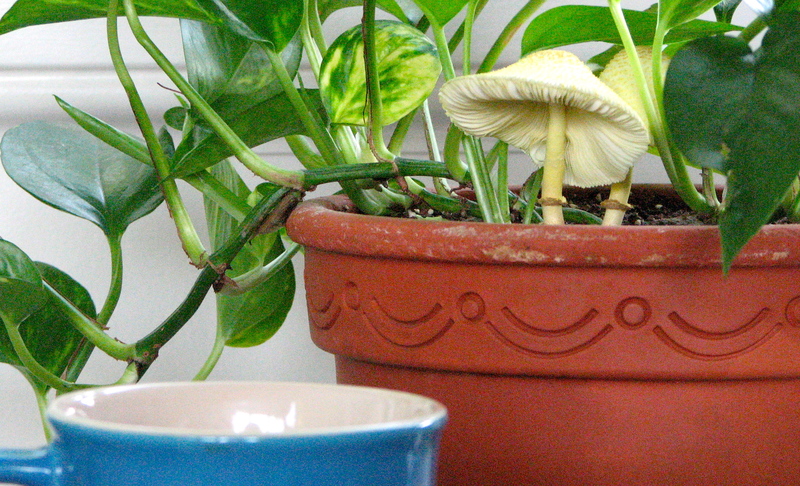 I’ve never had mushrooms pop up in potted plants! Pretty! Perhaps petite pixies perch upon them. Very nicely said, Zazzy. 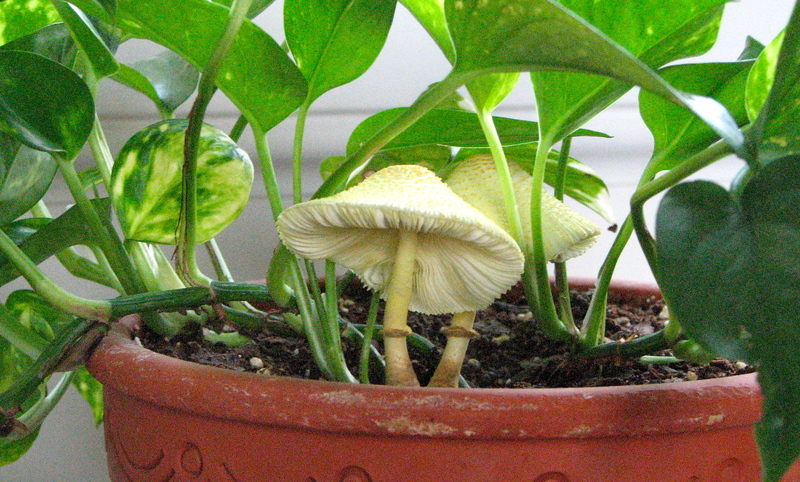 I’m sure that petite pixies were involved in the mushrooming of my pothos. Glad that you mentioned that. Cute post – well done! Oh, we evicted some of those pixies this morning from RC’s window container of cat grass. (We were afraid she wouldn’t graze around it.) Did shake the container a bit to wake them up and suggest they transport themselves to an outdoor location quickly. It’s so weird – we’ve never had those grow indoors before (the blinds are closed against the 100 degree heat right now). And now one has appeared at your house…. Phil, I’ve never seen these mushrooms before– & now I learn that they can form on the inside of the house, too. Well, if they do I just hope that they choose a plant in a room where their yellow mushroom color coordinates as nicely as it did on the screened-in porch. Lovely story. I like the way you saw the same shade in your mushrooms as are in your cushions. Have to admit, my first instinct would have been to hoik them out, but then I’m scared of mushrooms unless they are in sanitised plastic cling film wrapped boxes from the supermarket. Also love the way your Meditteranean (?) Le Creuset cup got into the picutre too! Polly, good eye on the LC mug color. I figured that the coffee mug would provide some perspective as to the size of the mushrooms. Plus pretty is as pretty does! Or as in the case of this fungus… freaky is as freaky does. Thanks, la p. Feel free to read it to yourself each night as a way of making you drowsy. Perhaps with a nightcap– to ensure proper sleep? Margaret, it’s a first for me to have this fungus appear, but after I got over the weirdness of it I decided that I rather liked these yellow mushrooms. One is doomed if one cannot adapt, eh? How about Pepe Le Pew and Penelope Pussycat – looks like one is trying to hide from the other!! Where are you, my little Mona Lisa? I am looking to find you!! I am the daring young flea on a manly trapeze, no? LOL. Your ability to quote Pepe is wonderful. I’d forgotten all about him.